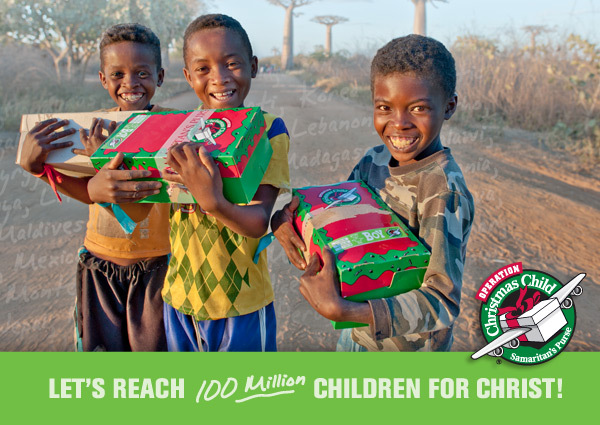 National Collection Week for Operation Christmas Child is November 12-19 — that’s THIS WEEK! People across the country are busy packing shoe boxes for millions of children around the world, lovingly preparing them before taking them to their nearest collection point. We expect to reach more children this year than ever before. You can help! There are many ways to help, whether it’s packing your own box, spreading the word, or dedicating your time to pray for the boys and girls who will receive these life-changing gifts. So get excited and join in! Packing shoe boxes is a great activity for families. Children love picking out gifts for girls or boys of their same age to enjoy. (HINT: The Dollar Store is a great place to shop for these items.) Fill the box with a variety of small gifts that will bring delight to a child. For instructions on how to prepare your own box and a list of suggested items to include, click on the link below. How to pack a shoe box. This year, we are trusting God to provide the 100 millionth shoe box gift packed and distributed since 1993. You can be a part of reaching this significant milestone. We’re excited about our 100 millionth shoe box gift, and we want to include you on the celebration! Check out the Operation Christmas Child page on Facebook to find out how you can follow this special little box as it is packed and hand delivered to a child overseas. Follow the 100 millionth shoe box tour on Facebook. Not sure where to take your box during National Collection Week, Nov. 12-19? It’s easy to find the nearest collection point by using our location tool. Simply type in your ZIP code to see the closest location to take your shoe box. Want to know what country the child receiving your box is from? When you donate your $7 for shipping online, you’ll receive a bar code to print and attach to your box. We’ll track your gift, and send an email telling you where in the world it ended up! Donate to follow your box. No Time? Build A Box Online! We know life can get pretty busy. But even busy people want to help change a child’s life. That’s why we’ve created a process where you can build a box for a boy or girl online. Simply select the gender, age, and hand select specific toys you want to include in the box. We help you personalize it by giving you the opportunity to upload a photo and include a message to your gift recipient. Can’t get easier than that! You can also give a family member or friend the opportunity to build a box. Begin building your box online. Nothing is more critical to the work of Operation Christmas Child than the prayers of faithful believers. Last year, thousands of people like you prayed for the children receiving the boxes. Please consider joining us during National Collection Week as we pray that God will use each shoe box collected this year for His glory, and that millions of lives will be impacted by the power of a simple gift. Chose your day and time slot. Operation Christmas Child brings joy and hope to children in desperate situations around the world through gift-filled shoe boxes and the Good News of God’s Love. This unique project provides an opportunity for people of all ages to be involved in a simple, hands-on mission outreach while focusing on the true meaning of Christmas— Jesus Christ, God’s gift. For more information, go to Samaritan’s Purse.org. This entry was posted in 300 Social Sciences and tagged charity, children, Christmas, donate, gift, Operation Christmas Child, shoebox, volunteer. Bookmark the permalink.